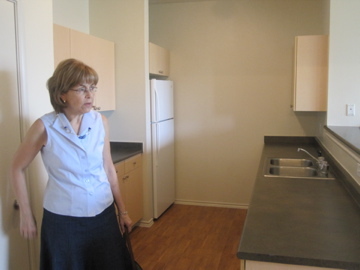 We looked at a total of 5 apartments, but I had narrowed it down to three that my mom and I contemplated over lunch. 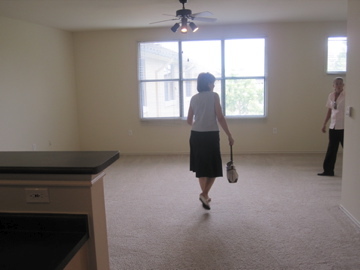 All three are in the popular Uptown area of Dallas which is about a 25 minute drive to work. 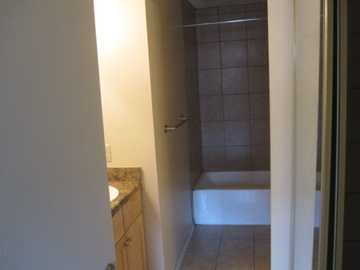 This studio apartment is located in Post Uptown Village. 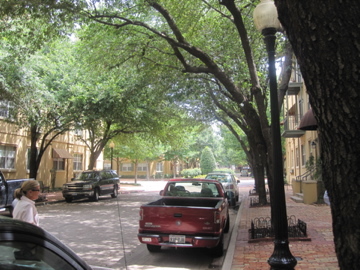 Post Uptown Village is composed of a few different buildings in a really cute tree-lined cobblestone area. It is just down the street from a great part of Uptown called State Thomas where lots of the fun bars are located. 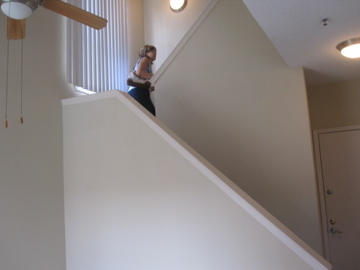 This apartment was on the fourth floor with no stairs, but was really close to the highway I would hop on to take to work. Not in this exact building, but in one down the street there was a nice pool and deck area as well as a small workout room. The apartment itself had a little nook that was natural to make into the “bedroom” and would have been perfect with just a set of shelving or a screen to divide it. 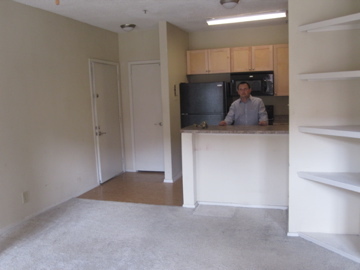 There was tons of open space and the kitchen was rather large. Despite being an efficiency, I absolutely loved how bright and open it felt. The other downsides to this efficiency were that there was no outdoor space (like a deck or balcony) and that the closet, while big, was shared with the water heater and felt sort of odd. It was also the most expensive of the three, but only by $65 dollars. Gables at the Katy Trail is on the other side of Uptown, not as close to the State Thomas area. It’s about 3 -4 blocks from the popular McKinney avenue where many of the restaurants and bars are and backs up to the Katy Trail. 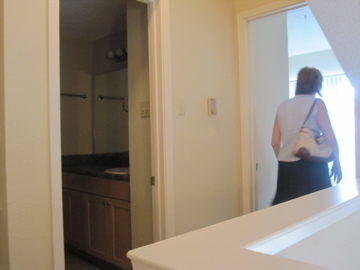 The split level option here was very interesting – a one bedroom/on bathroom with entry on the third floor. The kitchen and living space were right when you walk in, and then a staircase led you upstairs to the bedroom and bathroom. Having the bedroom and bathroom on a separate floor really made this space feel homey. But apparently the AC unit is on the ground floor so it can get expensive to keep it cold up there. 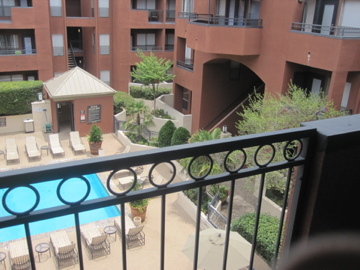 I really loved that this apartment had a balcony overlooking the community pool. This community had a very minimal workout center in the basement right next to the laundry area. It would definitely only be a back-up and not reliable for daily workouts. 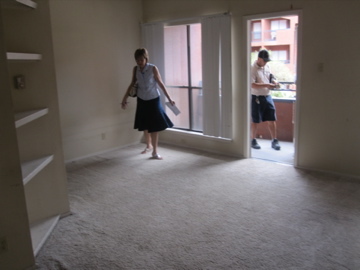 It was the middle price of the three apartments. Located in the same development as the previous split-level, this efficiency was the cheapest of the three by over $100. It was also the smallest. The kitchen and bathroom were plenty big and nice, but the living space itself was tight. It would have been difficult to fit a full-sized bed and a couch inside. This apartment also featured a balcony overlooking the pool. It got me thinking about how much space I truly needed and what that extra money was worth to me. $100 is a hefty portion of utility bills, could cover a gym membership, or is nice spending money. I’ll reveal my final decision, but I’m curious to hear which one YOU think I chose! Let’s play Apartment Hunters! from → Career, Travel, Trips/Vacations! I’m going with Apartment 2! I think you picked #1! I am going to guess number 2! Haha, LOVE the Househunters addition! Can’t wait to hear which one you picked!!!! I love house hunters! 🙂 I’m excited to see what you pick! I love apartment #2! I don’t have any clue which one you might have picked, you’re harder to figure out than the people on HH. Usually they go with the cheapest so I will say you picked #3. I’m glad you liked the city, it makes the move so much easier! I’d say you picked #1! 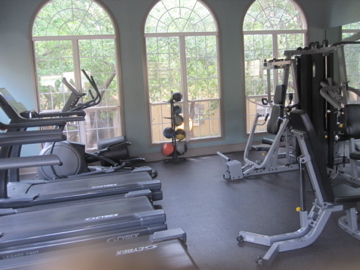 Exercise room, good location! Can’t wait to see what you picked! I would say #3…You would be saving money each month and you won’t be in Dallas forever. I love how everyone loves House Hunters! I’m going to go with number 2, but they all seem good to me! Oh I love House Hunters! This is a fun game. I’m going with Number 2. I was going to pick #2 for sure, but then I read #3 and I’m torn. Either way you’d prob end up joining another gym so I guess it depends if you want more space or not? Final answer, #2. I like #2 myself, but I have a feeling you rolled with #3? I am going with apartment #1 🙂 Can’t wait to hear which one you picked! I’m going to guess that you picked #2. Excited to hear! APARTMENT TWO FOR SURE!! YOU can use the pool for exercise and you are going to want a pool in Dallas!!! It gets miserable there..
P.s. I hope KELLY chimes in and offers her opinion on where she thinks you should live!!!!! Hmmm, I’m going to say #2. A homey feel is important, plus the balcony overlooking the pool is very nice. Plus, I always like to have the bedroom on a different floor…perhaps going back to the homey feeling 🙂 I’m curious to see which one YOU chose! You will make any place fabulous! how fun! so glad you found a place! I would guess #2? I am watching house hunters as I read this! Ha! Love it. I think 2…. Although I am torn between it and 1. I love apartment 2, but I think you picked 3!!! Or at least that’s what I would do if I were in your shoes!!! I’m just glad to here that you found an apartment 🙂 Congrats! Ohh all of the apartments look like great options! I’m so happy to hear that you are having a good experience! I think you picked #2! Save money on housing if you’re not that into entertaining. Splurge elsewhere. I think you picked no. 3.